May was a busy month in the depths of the Romanian Black Sea, with an international team of divers mapping the remains of the Moskva wreck, in search of the true story of how this impressive warship capsized during World War II. Freshly brought to Romania by Respiro Diving Center, M/V Argo was the vessel that took the team off-shore every day for a two hours trip to the wreck, making them resemble even more the Greek mythology explorers, looking for the Golden Fleece on a boat called alike. End of May concluded the one month long explorations and the following step is to illustrate what they’ve achieved, through presenting their results and imagery worldwide. We met Mircea Popa from Respiro Underwater Research Society and the technical GUE trained divers Max Kryvonos, Philip Yakymov, Oleg Blazhkunov, Serg Ivchenko, Julia Golosiy during a beautiful sunny May afternoon, by the Tomis harbor in Constanţa, when they’ve just returned from the sea, late after 5pm and a difficult diving day. Burnt by the sun and sea, they seemed a bit tired, but still satisfied with what they’ve achieved during the day. They spared some time before they went about their business and we had a group interview, with answers coming from all corners of the table: short and to the point, no unessential details, no embellishments. “How is Romania?” was the ice-breaker question. “We were in Romania last year, when we actually found Moskva, and then we came back for the anniversary, also last year, so we are for the third time here and we feel very welcomed”, explained Philip Yakymov. Next question in line, coming natural, was why they were interested in Moskva. The dialogue started to build with everybody at the table. Being a team with members from both Russia and Ukraine they considered this a very interesting wreck, “a truly unique project”, but first of all a part of their history, so it couldn’t be just another dive site. 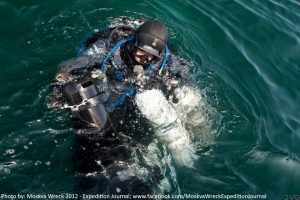 The Russian destroyer Moskva made the headlines in Romania last year , when it was finally discovered on May 3rd, after two years of research and exploration by Respiro Underwater Research Society and a few days after a group of divers from Russia and Ukraine, GUE representatives, joined the searches. 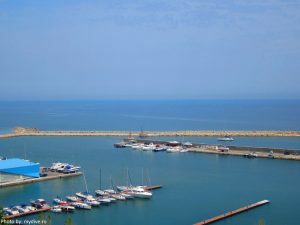 One of the myths of the Black Sea’s underwater world has thus surfaced and was presented to the public. 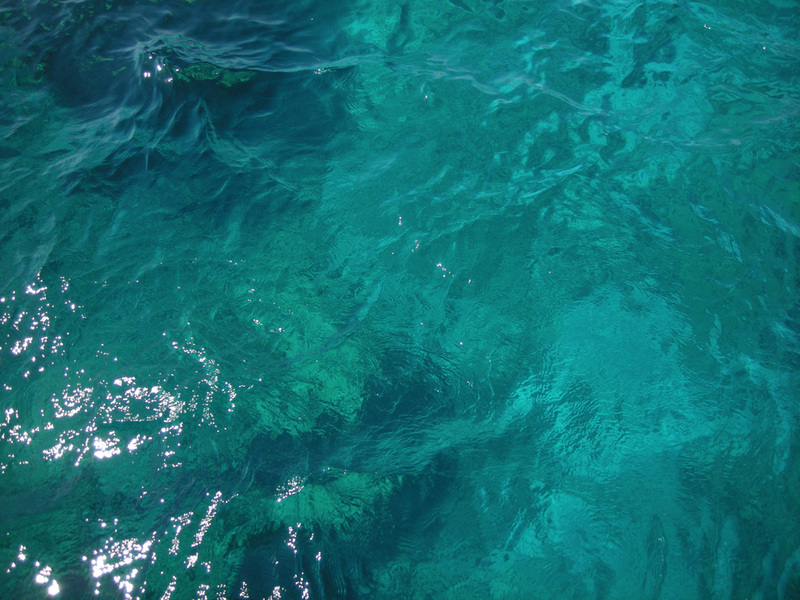 This year’s exploration episode wanted to bring more clarity in regard to what really happened to Moskva, according to what is found on the sea bed. 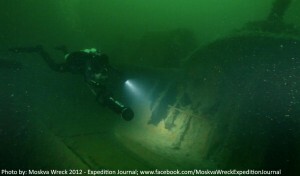 “There is one huge piece laying 300 meters from the ship. We checked the main part of the original 127 meters and we were trying to understand what happened because the people who can still remember what happened then are providing different information”, explains one of the exploration group’s members. And indeed, Moskva is still keeping some of the mysteries for itself – it is not yet clear what sunk the warship: a mine blowing up in the weir, the explosion of the ammunition found onboard the ship while being hit by a projectile shot from an enemy vessel or the attack of a submarine found in the area. Data gathered until now indicate that the Russian destroyer, together with other four ships, was sent, on June 26th, 1941, to attack the Constanţa harbor (Romania). After a raging attack in which were shot towards the coast 350 projectiles, the Romanian destroyers “Regina Maria” and “Mărăşti”, found at sea, together with the coast artillery, succeeded in turning around the Soviet vessels. Crossing the landmine weir built between Midia Cape and Tuzla, an explosion took place and the Moskva warship was sunk in less than 5 minutes. 70 years later, an international team of divers is mapping all the parts of the wreck, gathering facts from the depths and trying to put the puzzle back together. After the first weeks of 2-3 dives per day, split in teams, they already have some very interesting observations, found some torpedoes and even some parts of the ship they didn’t see last year. Water temperature was around 5°C and the visibility was poorer than last year, 5-7 meters compared to the amazing 15 meters in 2011. 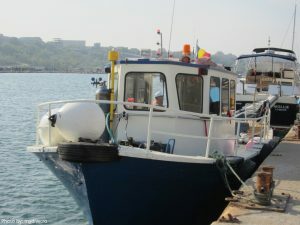 M/V Argo, Respiro’s mobile diving center, a 12 meter long by 4 meter wide boat, was taking them daily to Moskva and back. The wreck is located at about 20km off the Romanian shore and lies at a depth of 45 meters (in fact it starts at 37 meters and descends to 45 meters), having its keel lying on the sand. Around two-thirds of the wreck is well preserved towards the stern, the destroyer being tilted around 30-35° towards portside, with its cannons, superstructure, propeller, wheel and other elements intact, even if the explosion broke the destroyer in two around the first engine area. Our dialogue partners make it clear that it is not a wreck available to any recreational diver; it requires proper certification and extended experience even for the technical divers. The expedition was supposed to be finalized end of May, but some bureaucratic misunderstandings left “the Argonauts” dry for a few days, until authorizations were checked and cleared. Last days were dedicated to filming in detail the remains of the Moskva, to be used in communication about the results in the media of Romania, Russia and Ukraine. Thus, Moskva will show its hidden face to the public. We ended our talk by the harbor with a final question: “What’s next?”. Philip Yakymov told us that “We have lots of subjects located near Crimea, with depths going from 50 to 100 meters and I think it will take us years to explore them. We also have one object in Romania, a submarine, 206.” About Mircea Popa’s future plans you’ll read in an upcoming mydive.ro article.